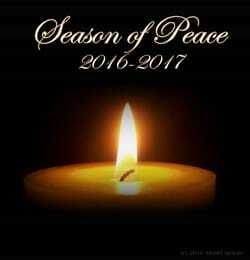 Due to extenuating circumstances, we will NOT be sharing any new channeling for the Season of Peace 2016-2017 celebrations. In discussing this situation with Guidance, they have suggested that each of you revisit the messages they shared in the celebrations for the 2015-2016 Season of Peace. The messages are still appropriate, as we all still have choices to make. You can find those messages in the Voices of the Archangels Library. We hope to bring many more messages out in the coming years. Thank you for your Understanding and patience for now. We wish you all a blessed Season of Peace and a happy Winter Solstice!